April 27th, 2011 is a day that will never be forgotten among Alabamians. Violent tornadoes rated EF-4 or higher (including four EF-5s) struck the states of Mississippi, Alabama, Tennessee and Georgia. Alabama was the hardest hit, with nine violent tornadoes touching down, and eleven total crossing within its boundaries. Over half the state had no electricity for at least five days. Lawrence County was cut in half by an EF-5 tornado that passed within two miles of my daughter’s house and eight miles of my own. An EF-0 touched down briefly within a mile of our home in the other direction as we sat in our storm room, searching the internet for news of family and loved ones in different cities. Phone service was minimal at best. Nothing says it quite like a video and the one below shows much of the damage. Some of the early pictures in this video show a cedar house and a gym demolished. My friend’s trailer sat next to them and was totally destroyed, killing her husband and injuring her. I’ll never forget the moment my daughter pulled up the picture of the gym on her phone. I cringed knowing how close my friend’s trailer was to it. When I’d talked to her only an hour earlier, she was at home with her family. A short while later, I learned her husband hadn’t survived and she was in serious condition in the hospital along with two of her sons. As we sat there trying to fathom what had happened, the phone rang. Across the county, another friend’s house had been damaged by the tornado, but she sought shelter in her bathtub and was okay. My husband left in his four-wheel-drive truck to pick up her husband and bring them both to our house. The trees down on our road alone had to be cut and moved twice that day so people could go in and out and check on loved ones. My son-in-law had several family members injured as their trailers were destroyed also. We had a houseful of people that night and the next days were blurred as my family moved to different sites to help clean up and find lost items blown everywhere. Fourteen people in our rural county alone lost their lives, 243 statewide. Members of my family, along with our Pastor and his wife, received numerous calls as a young lady in a neighboring county with the same name as mine was killed. Several days later, I was in Moulton and approached by a friend I’d not seen in years. She ran to me and hugged me, tears in her eyes. Until that moment, she didn’t know I’d survived. In Alabama, we learned a lot that day. The extensive warnings ahead of time saved numerous lives I’m sure, but many still didn’t heed the warnings. I’ll never take another outbreak of storms lightly. Everywhere you look, you still see signs of that day: houses never rebuilt, woods shattered, and a new skyline. As the third anniversary of that day approaches, Alabama will hold services, memorials, and family gatherings to remember lost loved ones. Monuments and parks have been established to honor those who died. People banded together then and still do today when a natural disaster strikes the area. I pray we never go through one again as we did on April 27, 2011. Have you ever had one of those weeks that you just don’t know what day it is? Well, that is this week for me. Usually I have something to remind me. Like church on Sunday, or my daughter’s dance on Tuesday, Thursday and Saturday, or rain on Wednesday. There has been little to nothing rain wise and the temperatures have been hot, hot, hot. Kind of odd for Kansas in June. Oh, it does get hot in June, but not usually this hot this fast. But I’m not here to talk about the temperatures, not really. I’m here to talk about clouds. As I’ve said there are so many different types. It’d take at least another month to cover them all. So, I’ve reserved today (a day late) for my favorite types of clouds. Cumulonimbus. There are several sub-species of these types of clouds and because they all form in unstable air they almost always produce some type of storm, whether it’s a little rain shower or a massive thunderstorm that produces tornadoes. These three pictures were taken the day of the Joplin tornado from just south of Topeka. These pictures were taken looking southeast. Although the tops are high (cumulus congestus) they don’t look to bad. Here the rest of the cloud base is beginning to explode and meet that single tower. This is a small example of cumulonimbus calvas. Of course, I’m betting the people closer to the storm would think it’s not so small. This is the same set of clouds, but they’ve moved further away. This is a different day and I’m looking toward the west as the sun is setting. My point of showing you this picture is for you to get a perspective of what these types of clouds look like coming and going. Looks ominous, doesn’t it? Just some funky looking clouds with wind and rain. Nothing more. I believe this is a very turbulent Mammatus cloud. These types of clouds can be associated with tornadic cells. And if I recall correctly this one did have tornado warning on it. This is a funnel cloud. My husband took this picture just a block from our home. And this is the same storm, the same funnel cloud. My brother took this picture from his house several miles northeast from ours. These clouds aren’t considered tornadoes until they actually touch the ground. Shielding her eyes, she scanned the western sky. In typical Kansas fashion, the sun shone high and hot, while bright, white clouds bubbled like suds in a washtub. A storm was brewing. If it got too hot, the clouds too high, a monster wind was sure to funnel down from the sky and rip to shreds everything in its path. This week’s writing prompt- choose one of the pictures above and write a small scene. We used to call them jet trails. 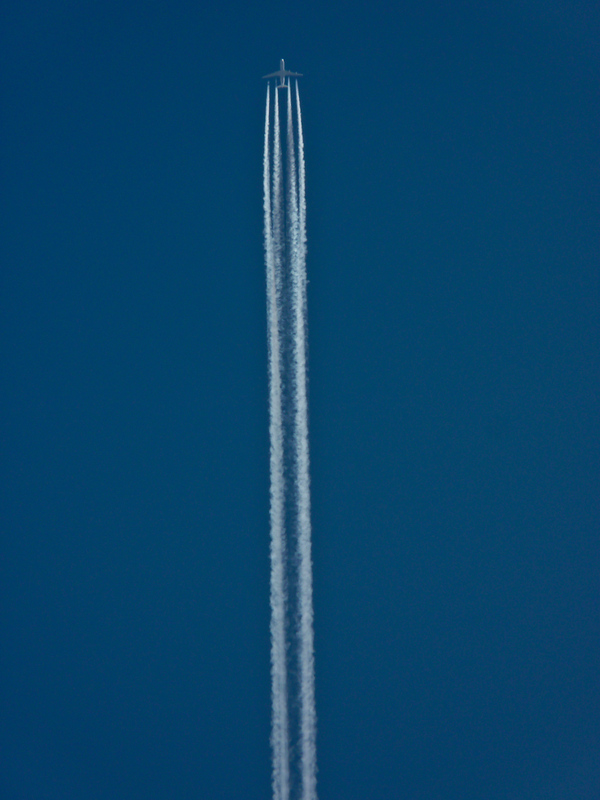 The thin lines across the brilliant, blue sky, evidence of the flight of an airliner. Sometimes you’ll see several, crisscrossing one another. I never really thought of these as being actual clouds. But they are. How are contrails formed? Jet engines emit exhaust that contains water vapor. Above 26,000 feet where the temperature is usually below -40 °F, condensation occurs quickly. Ice crystals form and your vapor trail is created. Contrails can also be triggered by changes in air pressure, (wingtip vortices) in lower altitudes, when the jets are traveling at slower rates of speed. They trail behind the wingtips and wing flaps rather than the engines. Contrails have an opposite effect called Distrails, which looks like a tunnel through existing clouds. It is the path of the jet, as shown in the picture below. I would like to note here that there is some concern about the longterm consequences of contrails and chemtrails. You can read more about this aspect at http://www.pbs.org/wgbh/nova/space/contrail-effect.html. There are so many types of cloud formations that we could talk about them for weeks on end and we haven’t even hit my favorites. Hopefully we’ll do that next week. 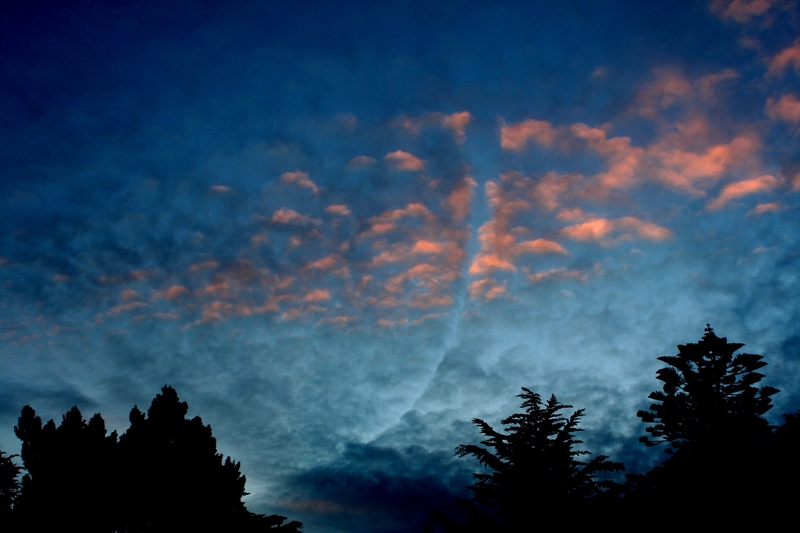 I’m hope you’re seeing the formation of clouds depends on what part of the atmosphere they’re in. They also depend on several other factors too. Like the cirrostratus. The cirrostratus are high based clouds “when convectively stable moist air cools to saturation at a high altitude” (http://en.wikipedia.org/wiki/List_of_cloud_types). Sometimes, websites say it best, especially when it comes to science. The thing about cirrostratus clouds, and I’m sure you’ve noticed it yourself, is that they almost always take up the entire visual when they move in. Since I don’t have a picture available, let me try to describe it to you. It’s like a wave riding across the sky. Well, riding depends on how fast the cloud is moving. The reason it takes up so much space is usually because a frontal line is pushing it, so depending on how quickly that frontal line is moving depends on fast the cloud moves. As the cloud gets closer, depending on the weight of precipitation, which depends on the temperatures and whether or not they’re clashing with other fronts, the cloud formations can begin to look lower, heavier and darker. This frontal cloud can mean rain or snow. Here is a great link to a time lapse video http://youtu.be/gNGhvbjBVQw. The optical phenomena that you see is most likely from the cloud formations changing and dropping into the lower atmosphere. It seems to me that as the clouds thicken and more ice crystals form, the sun reflects off of them like a prism causing the beautiful spectacle. The videos I shared are of a more dramatic nature of the cirrostatus and come along with other cloud formations. As I said above, much depends on the many other factors. However, there are times when the cirrostatus appears to be nothing more than a thin sheet of lace. I love how dictionary.com describes the cirrostratus– appearing as a whitish and usually somewhat fibrous veil. Writing prompt: A slight breeze tugged on the linen as Nonnie secured it to the clothes line. She glanced toward the western sky. A thin sheet of delicate, white lace, much like her grandmother’s curtains, spread from the north to the south. However, that beautiful picture was not what caused her breath to hitch in her lungs . . .